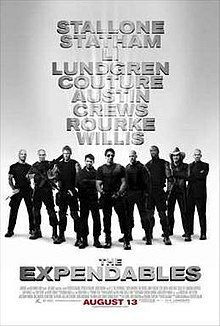 www.newmanfilms.net: TV SPIN OFF EXPENDABLES STARRING WHO? WOW! TV SPIN OFF EXPENDABLES STARRING WHO? WOW! It is with great displeasure I understand that there are TV series in the works,. This is not a general statement about TV as a whole, but about the spin offs that are being developed for promotional cash in purposes. The latest rumoured are Expendables staring the mighty(once) holy man Steven Seagal. A turn on the film RED, starring who knows who, and possibly Step Up – as in dance films ahoy. Well I am not sure that I can handle this announcement, and wonder if the networks have gone crazy I tell you! Now I would imagine that the characters will be the same, played by different actors; but for every Stargate SG1 we get a Mr and Mrs Smith don't forget. Original programming please, surely is the way forward. Now budgets are there for TV to take over the world of action, and if Spartacus series prove there is a taste for it worldwide, but I would hate to see a franchise ruined by immediate knee jerk make money schemes. Movies have around 100 million or so (give or take wages and marketing) for 90 mins to 120 mins. TV has usually about 2-4 million for one hour – so there you have it. Needs to be done well.